The Commonwealth Disability Discrimination Commissioner (and Adelaide University Law Alumni), Alastair McEwin returned to the Adelaide Law School on 12-13 September, some 25 years after graduation, to speak at a topical public event with Professor Melissa De Zwart, ‘Back to the Future: Technology and People with Disability‘ and to speak to the Law School’s Law Reform and Anti-Discrimination Law classes. A highlight of Mr McEwin’s visit was his insightful and engaging presentation to the Law Reform class on his role and work at the Human Rights Commission on disability, discrimination and the NDIS. 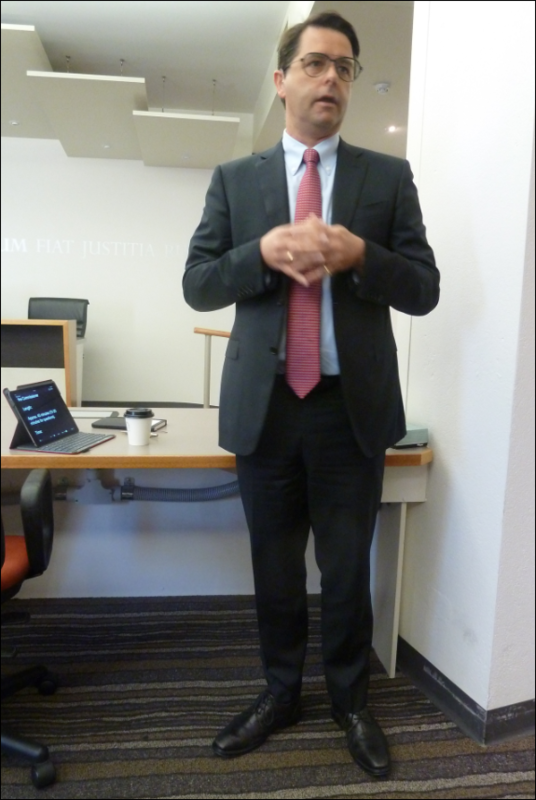 Alastair spoke powerfully about law reform in action and the pursuit of social justice and discussed his interest in the work of the SA Law Reform institute including the valuable input of the Law Reform class to SALRI’s work. Rachael Ingleton, one of the Law Reform students, notes Alastair McEwin’s visit was one the highlights of the Law Reform class. Although he noted some changes around Ligertwood since his graduation 25 years ago, including the loss of the notorious ‘pigeon holes’, he emphasised some of the enduring values that all law students and junior lawyers should have. These include respect, dignity, and self-control. Alastair was generous in outlining various projects he is currently working on as Disability Discrimination Commissioner. Rachael notes this was particularly useful for students in the Law Reform class, as ‘we are often researching inequalities before the law, and how they arise. More importantly, we also look at remedying these injustices, and Alastair illustrated the complexities associated with such projects: politics, funding and societal and cultural barriers must always be navigated to create real change’. We are thankful for Alastair’s generosity with both his time and advice. His visit was simply inspirational and it has left a lasting impact on the class. Professor John Williams, SALRI Director, and Dr David Plater, SALRI Deputy Director, also express their appreciation to Mr McEwin for his generous presentation and all who supported his recent visit. We hope to see him again soon at SALRI and the Adelaide Law School. This entry was posted in Government & Citizenship, Research, Society & Ethics and tagged adelaide law school, Events, law reform, professor john williams, salri, South Australian Law Reform Institute (SALRI). Bookmark the permalink.